Samsung has finally launched their latest flagship device the Galaxy S5 which was showcased at the Mobile World Congress in Barcelona. 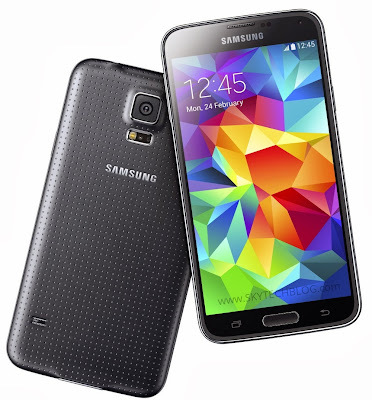 The Samsung Galaxy S5 has a 5.1 inch Full HD Super AMOLED display and it is powered by a Octa-Core Exynos 5422 (A15 1.9 GHz ＋ A7 1.3 GHz) processor with ARM Mali T628 MP6 GPU. The phone runs on Android 4.4 (KitKat) with Samsung Touchwiz UI on top. At thqe back it has a 16 megapixel rear camera.with LED Flash which is capable of 4K video recording. Other camera features include HDR (Rich tone), Selective Focus, Virtual Tour Shot and more new features and a 2.1 megapixel front facing camera. According to Samsung the phone has world’s fastest auto focus speed up to 0.3 seconds. It has IP67 ratings for Dust and water Resistance. Finger print Scanner is a new add on for a secure, biometric screen locking feature and mobile payments. Samsung improved the apps like S Health with additional tools including a pedometer, diet and exercise records, and a new, built-in heart rate monitor. Under the hood it has 2800 mAh battery with Ultra Power Saving Mode that turns the display to black and.white, and shuts down all unnecessary features to minimize the battery consumption.